If you look carefully, you can see there are two identical patterns here; left and right. The left is taken with uncrossed polars, and the right with crossed polars. Not only fun, but instructive as well! 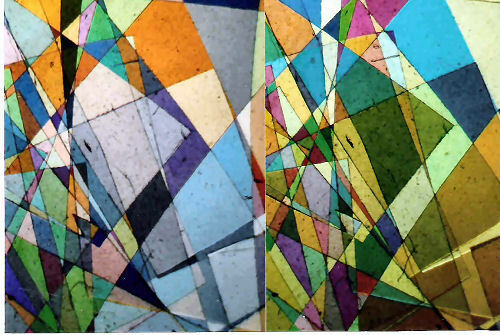 This picture is one of my “Fun with Cellophane” slides, at low magnification between crossed, and uncrossed polars. I construct them by snipping up tiny pieces of Cellophane (greeting card wrappings seem to be usually made of Cellophane) and piling them randomly on a slide before placing a coverslip over them. I use long (24×50 mm) slips, and attach them with double-sided Sellotape. You can see how difficult it is to keep the dust out! For an explanation of how the colours are formed, see the article on The magic of polarised light.